“Purl” is about a pink ball of yarn who joins B.R.O. Capital. 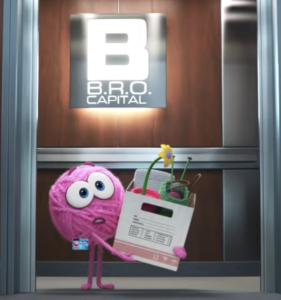 Pixar’s new animated short film Purl takes viewers inside “B.R.O. Capital” — a company dominated by stereotypical “bros” who tell raunchy jokes, shout over one another, and leave work early to get two-for-one chicken wing specials. So when a pink ball of yarn named Purl is hired, the bros are mystified. Purl tries to participate in the work culture, but is shunned. She tries to fit in by knitting herself a suit-and-tie look. When a yellow yarn of ball joins the company, Purl reassess what she’s become. Soon, the office is teeming with balls of yarn and the overbearing culture of toxic masculinity is replaced by a more collaborative, open, and tolerant environment. Purl is part of Pixar’s SparkShorts series, which seeks to empower filmmakers of different backgrounds. The quirky short film was created by Pixar filmmaker Kristen Lester, who said that Purl is based on her past work experiences. “My first job, I was like the only woman in the room,” Lester explains in a behind-the-scenes video. “In order to do the thing that I loved, I sort of became one of the guys. “And then I came to Pixar, and I started to work on teams with women for the first time and that made me realize how much of the female aspect of myself I had buried and left behind,” she added. While Purl is an animated film, the only aspect of its story that strays from reality might be the talking balls of yarn. The film highlights how gender biases can drive unequal outcomes in the workplace and underscores how far many companies in the US still have to go to achieve gender equality. It also shows how difficult it is for women to be accepted in male-dominated work spaces, even when they behave the same way as their male colleagues. An investigation by the Harvard Business Review found that women at one company were paid less and held fewer senior leadership roles, despite behaving no differently than their male co-workers in terms of who they interacted with and how much time they spent working. The women were also promoted less often, though they received identical performance reviews to men. The authors of the report concluded that implicit biases were at the root of the company’s inequalities. These findings hold true throughout the broader US economy. Women in the US earn 80% of what their male counterparts make despite having identical qualifications, and that gap is even wider for women of colour. While 44% of the employees at S&P 500 companies are women, fewer than 20% of senior level roles are held by women. Similarly, only 6% of S&P 500 CEOs are women. The US Equal Employment Opportunity Commission (EEOC) estimates that anywhere from 25% to 85% of women have experienced sexual harassment in the workplace. This wide range accounts for the fact that many women are deterred from reporting instances of harassment because they believe their allegations won’t be taken seriously or that they will face consequences. In fact, 75% of women who have reported workplace harassment encountered retaliation, according to one report that the EEOC cites. A Pew Research Study found that 42% of women have experienced discrimination in the workplace, including being insulted, passed over for assignments, and treated as though they were less competent than their male counterparts. At the end of Purl, B.R.O. Capital is a lot more welcoming to employees like Purl, which suggests that workplace discrimination and inequality can be reduced by improving employee diversity. While increasing diversity is essential, it doesn’t necessarily get rid of the glass ceilings that maintain gender inequality in the C-suite. In addition to hiring people of diverse backgrounds, companies can also mandate diversity quotas for senior level positions and boards to control for implicit biases and ensure that their leadership is more inclusive. Beyond that, the government can support legislation to address pay inequity and workplace discrimination. Right now, a bill for equal pay is making its way through Congress. The Paycheck Fairness Act builds on the Fair Pay Act of 1963 and supporters say it provides women with critical tool for closing the pay gap. “We cannot subject another generation of women to this injustice,” Lilly Ledbetter, a pioneer of pay equity, said in a press conference supporting the bill. Workplace gender inequality takes many forms, including sexual harassment, open discrimination, and unequal compensation. Women who have the same qualifications as men still earn less while doing the same job. Closing the gender pay gap is a key part of advancing gender equality. You can join us in taking action on this issue here.